Rashid, B., Leman, Z., Jawaid, M., Ghazali, M. J., and Ishak, M. R. (2017). "Influence of treatments on the mechanical and thermal properties of sugar palm fibre reinforced phenolic composites," BioRes. 12(1), 1447-1462. 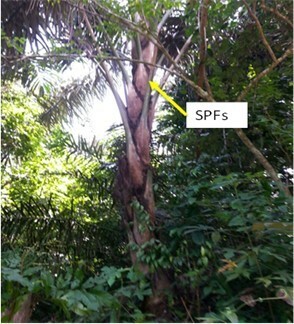 Sugar palm fibre (SPF) was used to prepare composites with phenolic resin. The SPF underwent treatment with either sea water for 30 d or a 0.5% alkaline solution for 4 h. The composites contained 30% (vol.) SPF in a powdered form, and the composite samples were fabricated by a hot press machine. The effects of the fibre treatments on the mechanical (flexural, impact, and compressive), thermal, and morphological properties of the composites were analyzed. The SPF treatments considerably improved the mechanical properties of the composites compared with the untreated composite. The alkaline treatment resulted in the most improved flexural and impact strength of the composites. In contrast, the sea water treatment had the best results for improving the compressive strength. Morphological analyses indicated that the surface treatments improved the fibre-matrix bonding. The thermal degradation analysis showed that both the sea water and alkaline treatments of the SPF slightly affected the thermal stability of the composites. Consequently, SPF can be effectively used as an alternative natural fibre for reinforcing bio-composites. The issues of global warming and environmental pollution are being addressed by many researchers. 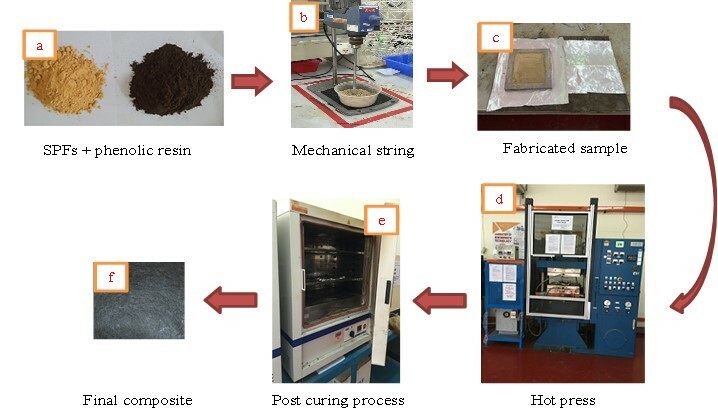 Natural fibre reinforced polymer composites, or green composites, could help to solve these problems (Palanikumar et al. 2016). Natural fibres have better properties than synthetic ones, such as low weight and cost, easy recyclability, biodegradability, abundant availability, renewable, and non-toxicity (Al-Oqla et al. 2015; Rashid et al. 2016a). Additionally, natural fibres have acceptable mechanical properties (Essabir et al. 2016). Several kinds of natural fibres have been used as reinforcements in polymer composites, such as kenaf, oil palm fibre, jute, roselle, and bamboo. Recently, the application of green composites has covered a wide range of industries, including construction, transportation, and furniture. Although there are many advantages to using natural fibres as reinforcements in polymer composites, there are some limitations. The high moisture absorption tendency, poor fibre-matrix interfacial bonding, and low thermal stability are the main problems of natural fibres when they are used to reinforce polymer composites. The performance of the composites depends highly on the fibre-matrix adhesion. When the fibre-matrix is weak, the fibres will pull out because the applied loads are increased, and composite failure will occur. A fibre surface treatment is one of the most effective methods to enhance the fibre-matrix adhesion and overcome this problem (Thakur and Singha 2015). Natural fibres consist of three main components, which are cellulose, hemicellulose, and lignin. Chemical coupling agents have two main functions, which are reaction with hydroxyl groups in cellulose and reaction with functional groups in a matrix (Li et al. 2007). Alkaline treatment is an effective chemical treatment of natural fibres when used to reinforce polymer composites (Zhou et al. 2016). The hydrophilic behaviour of the lignocellulose in the fibre weakens the fibre-matrix interfacial bonding. A natural surface alkali modification splits the fibres into microfibers, and leads to closer packing of cellulose chains because of the internal strain discharge. This leads to improvement of the mechanical behaviour (Rajkumar et al. 2016). Many researchers have studied the effects of the surface treatment of natural fibres on the behaviour of the biopolymer composites (Ishak et al. 2013c; Sudha et al. 2015). The effect of alkaline treatment on the mechanical properties of oil palm press fibre reinforced epoxy composites has been investigated (Obasi et al. 2014). The treatment removes hemicelluloses and other impurities and enhances the mechanical properties. Fiore et al. (2015) evaluated the mechanical properties of kenaf/epoxy composites after an alkaline treatment. The results exhibited higher moduli compared with the net epoxy composites. Also, the effects of different chemical treatments on the thermal properties of banana fibre/phenolic composites have been evaluated (Joseph et al. 2008). The composites show much higher thermal stability of the fibre, but they are less thermally stable than net phenolic composites. A thermal study of the influence of sisal fibres on the thermal stability of the blends of PP and polyolefins showed that the thermal degradation was changed after the treatment. For sugar palm fibre composites, chemical treatments enhance the fibre-matrix interfacial bonding, which results in good mechanical properties (Bachtiar et al. 2013; Ishak et al. 2013c; Razali et al. 2015). Sugar palm fibre (SPF) (Ijuk) is mainly found in Malaysia and Indonesia. It is a potential alternative reinforcement to replace conventional synthetic fibres (Ishak et al. 2013c). Additionally, SPF has comparable advantages that are similar to other natural fibres. It has a high durability and good resistance to sea water (Rashid et al. 2016a). In addition, the fibres are wrapped around the tree trunk, so high yields are easy to obtain without additional processing. Novolac type resins have a high rigidity, good dimensional stability, and excellent heat resistance due to a highly cross-linked structure (Rashid et al. 2016b). Incorporating natural fibres into phenolic composites enables the composites to overcome the high brittleness. Phenolic (PF) resins create chemical bonds with the natural fibre reinforcement because of a good affinity between the fibre and matrix (Joseph et al. 2008). Thus, the fibre-polymer has high wettability. However, none of the earlier studies examined SPF incorporated into a phenolic matrix. This work evaluated the influence of fibre surface treatments on the mechanical and thermal properties of sugar palm fibre/phenolic (SPF/PF) composites. In this study, 30% (vol.) untreated and treated SPFs were used as reinforcement materials in the phenolic composites. The fibres were treated with sea water and an alkali solution and then used for composite fabrication. Morphological studies of the composites after the impact test were also conducted using scanning electronic microscopy. SPF (Arenga pinnata) was obtained from an area in Kampung Kuala Jempol, Negeri Sembilan, Malaysia. The fibres were black and tough, and they were wrapped around the whole length of the sugar palm tree trunk (Fig. 1). The fibres were cleaned, washed using tap water, and dried. Afterwards, they were ground to obtain fine particles with a size less than or equal to 150 µm, which were used in the current study. Before composite fabrication, the sugar palm particles were oven-dried for 24 h at 80 °C to eliminate the moisture content (Ishak et al. 2013b). A typical straight Novolac (PF) type resin (PH-4055; Chemovate, Bangalore, India) was used for the composite preparation. For the alkaline treatment, SPF was soaked in 0.5% sodium hydroxide for 4 h at room temperature. The fibres were washed with distilled water and dried (Rashid et al. 2016a). For the sea water treatment, the fibres were immersed in sea water for 30 days (Leman et al. 2008). Subsequently, the fibres were washed with tap water and dried. The SPF/PF composites with 30% (vol.) reinforcement were prepared on a hot press (Leman et al. 2008; Rashid et al. 2016a). The fibre particles and phenolic powder formulation were dry-blended properly in a mechanical string for 15 min at 250 to 500 rpm to obtain a homogeneous mixture. The mixture was poured into a mould and hot-pressed at 160 °C and 275 MPa pressure for 20 min. At the beginning of the process, the pressure was released several times to release the gases generated from the cross-linking reaction of the phenolic resin (Surojo et al. 2014). The sample was post-cured in an oven at 130 °C for 4 h to relieve the residual stress in the composites. Figure 2 shows the composite fabrication process. Finally, composites with the dimensions of 150 mm × 150 mm × 3 mm were cut with a vertical band saw according to the ASTM standards for the various tests. The untreated, sea water treated, and alkaline treated SPF/PF composites were assigned the labels UT, ST, and AT, respectively. The flexural stress and flexural modulus were determined by a three-point flexural properties test conducted at room temperature according to the ASTM D790-10 (2010). The samples had dimensions of 130 mm x 13 mm x 3 mm. The test employed a crosshead speed of 5 mm/min and a support span of 100 mm. The maximum compressive strength and compressive strain were obtained from the compressive test, which was conducted based on the ASTM D695-15 (2015). The dimensions of the samples were 15 mm x 13 mm x 4 mm. A load was gradually applied to the sample, which was placed between the plates of the compressive plate tool, with a crosshead speed of 1.5 mm/min. The unnotched Izod impact test was carried out according to the ASTM D256-10 (2010). The test employed a rectangular specimen with dimensions (80 x 10 x 3) mm3, and a 0.5 J type hammer. The impact strength (toughness) in kJ/m2 was analysed as the energy per unit area. At least 5 specimens were used for every test for each fibre treated composite, and the final reading was the average of all of the readings. Figure 3 shows the setup of the flexural, compressive, and impact tests. A Hitachi Model S-3400N PC-based variable pressure SEM (Tokyo, Japan) operating at a voltage of 15 kV was used for the morphological analysis. SEM was used to investigate the impact fracture mechanisms and the interface adhesion of the fibre-matrix of the composites. All fractured specimens were coated with a thin layer of gold using a model K575X Sputter Coater (Emitech, UK), to eliminate the effect of charging. Thermogravimetric analysis (TGA) and differential thermal analysis (DTG) tests were carried out using a Mettler Toledo thermal analyser (TGA/SDTA 851e, New Castle, PA, USA). A sample of 8 to 20 g of the SPF/PF composites was heated in the sample pan. The test was performed within a temperature range from 30 °C to 800 °C at a heating rate of 10 °C/min, and a flow rate of 20 mL/min in a nitrogen atmosphere. The mechanical properties of composites are pivotal for many applications. The behaviour of the composites depends on the combined properties resulting from the matrix and fibres. The properties of bio-polymer composites depend on the fibre-matrix compatibility, fibre loading, aspect ratio, fibre-matrix adhesion, and processing conditions (Bai 2013). Flexural, compressive, and impact tests elucidate the mechanical behaviour of the composites. The flexural strength refers to the capability of the composites to withstand bending stress before reaching the point of failure. Two different modes of failure—bending and shear—occurred in the composites. As the shear or bending stress reached the critical value, failure occurred (Joseph et al. 2002, 2015). The stress-strain flexural curves of the untreated and treated SPF/PF composites are presented in Fig. 4. The results showed the typical brittle relationship for bio-composites, i.e., the load increased progressively to the maximum value and then suddenly decreased. From the obtained results, the UT composite showed lower flexural strength than the AT and ST composites. The effect of the treatment on the maximum flexural strength and flexural modulus is shown in Fig. 5. As expected, the treatments resulted in notably increased flexural behaviour. The AT composite displayed the highest flexural strength at 92.59 MPa, followed by the ST and UT composites at 88.21 MPa and 75.24 MPa, respectively. The flexural strength of the AT and ST composites was improved by 23.1% and 17.2%, respectively, compared with the UT composite. The UT composite exhibited a lower flexural behaviour, which revealed the weak interfacial bonding of the fibre-matrix. The poor bonding between the SPF fibres and matrix as can be seen from SEM images section of the current study, where many pulled-out fibres were observed. This clearly indicated that the load transfer between the fibres and matrix was ineffective. Interestingly, both the sea water and alkaline treatments enhanced the flexural strength, which was attributed to strong adhesion between the fibres and matrix. Furthermore, the increased flexural strength was good evidence that both of the treatments promoted better interfacial bonding and good wettability (Zhou et al. 2016), which resulted in an effective stress transfer between the fibre and matrix. Fibre-matrix bonding strongly affects the mechanical properties of bio-composites (Joseph et al. 2008; Rajkumar et al. 2016). The sea water treatment changed the fibre surface topography by removing the rough outer surface, wax, and impurities from the outer surface of the SPF (Leman et al. 2008; Rashid et al. 2016a). This reduced the fibre diameter, which indirectly increased the aspect ratio and improved the mechanical properties (Ishak et al. 2013c). In contrast, the alkaline treatment influenced the chemical composition of the fibre and had a physical effect on the fibre surface as well (Rashid et al. 2016a). The alkalisation disrupted the –OH bonding in the structure of the composites, which increased the roughness of the surface. The alkaline treatment dissolved a certain amount of lignin and hemicellulose components from the fibre structure, and it also removed the wax, oil, and impurities from the outer surface of the fibre. This promoted the cellulose content in the fibres, which resulted in a positive effect on mechanical properties (Sudha et al. 2015). By removing the outer layer of the fibre, the diameter was reduced, and thereby, the aspect ratio increased, which resulted in a good mechanical strength. This may have been a reasonable explanation for why the alkaline treatment of the fibre had a better influence on the flexural strength of the phenolic composites than the sea water treatment. 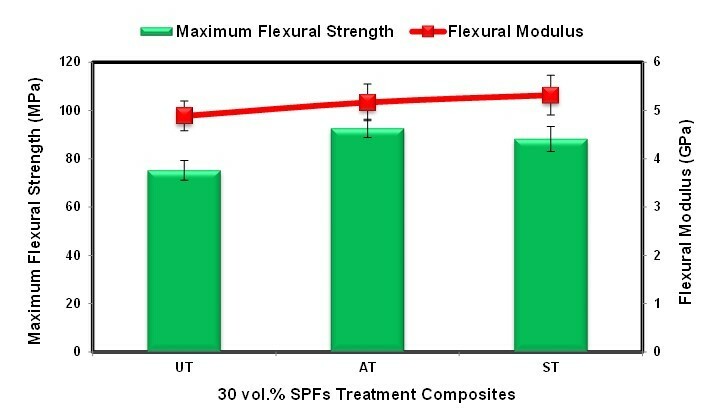 Figure 5 also presents the effects of the treatments on the flexural modulus of the SPF/PF composites. The ST composite showed the highest flexural modulus with a value of 5.32 GPa, followed by the AT and UT composites with values of 5.17 GPa and 4.89 GPa, respectively. The SPF treatments affected the flexural modulus and wettability of the fibre-matrix, which resulted in the good flexural characterisation of the composites. Thus, the fibre treatment highly affected the flexural behaviour of the composites. The impact properties of bio-composites depend highly on many factors, such as the fibre constituents, fibre-matrix adhesion, fibre orientation, fibre loading, construction of the composites, and the test conditions (Joseph et al. 2002). The common failure modes for the impact loading of the bio-composites are pulled out fibres, fibre breakages, fibre/matrix debonding, and matrix cracks. Normally, the load is transferred by shear force to the fibres. Thus, if the applied load exceeds the fibre-matrix interfacial bond, composite failure occurs. Moreover, friction along the interface transfers the stress to the debonded fibre. If the fibre stress exceeds the fibre strength, fibre breakage may occur. When the fracture pulls fibres out of the matrix, the energy is dissipated (Joseph et al. 2002). The influence of the untreated and treated SPF on the impact strength of the composites is presented in Fig. 6. The UT, AT, and ST composites showed the same trend for the flexural strength for all of the composites. There are two factors that strongly influence the impact strength of the composites: fibre-matrix adhesion and incapability of the fibre to absorb energy. If the interfacial bonding between the fibre and matrix is good, then the stress is efficiently transferred from the impact load to the fibre via the matrix. 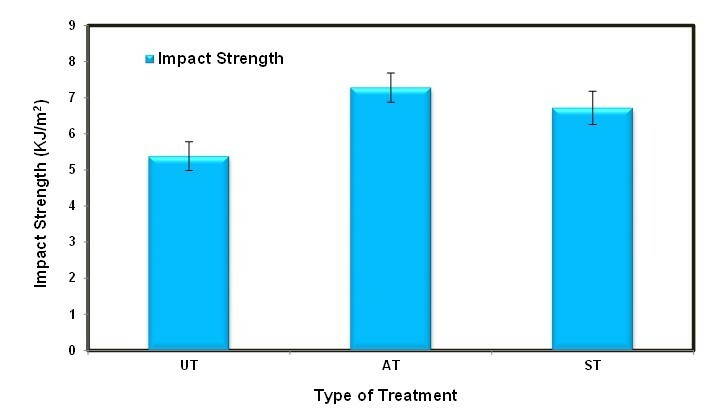 The results showed that the AT and ST composites exhibited higher values of impact strength, which were 7.28 kJ/m2 and 6.72 kJ/m2, respectively, compared with the UT composite (5.38 kJ/m2). Thus, the alkaline and sea water treatments improved the impact strength compared with the untreated SPF/PF composite by 35.3% and 24.9%, respectively. This finding suggested that the treatments enhance the interfacial bonding between the fibres and matrix, leading to good load transfer and good mechanical properties. The compressive strength is the resistance of a material to breaking under a compression load. The maximum compressive strength is the maximum amount of compressive stress that a specimen can sustain under a gradually applied load without fracture. The compressive stress-strain results of the untreated and treated SPF/PF composites are presented in Fig. 7. However, the value started decreasing with the formation of a crack on the surface of the specimen, which was observed during the test, and formed before deformation occurred. The ST and AT composites showed higher compressive strength at 136.27 MPa and 131.42 MPa, respectively, compared with the UT composite at 125.41 MPa. As discussed before, fibre treatment strongly improves the adhesion of the fibre-matrix and leads to a good interlocking surface between the fibre and matrix. However, the ST composite dominated the highest values of the compressive strength, possibly because the SPF treated with sea water contained a high percentage of Si compared to the SPF treated with the alkaline solution (Rashid et al. 2016a). The high percentage of Si in the ST composite, along with the good interlocking surface of the fibre-matrix, may have promoted the compressive strength of the ST composite. Consequently, the fibre surface treatments enhanced the compressive strength of the ST and AT composites compared with the UT composite by 8.7% and 4.8%, respectively. Based on these results, both of the treatments contributed to enhancing the mechanical properties of the SPF/PF composites. As previously reported, the sea water and alkaline treatments helped to remove the outer surface of the SPF and enhanced the adhesion between the fibre and matrix, which improved the mechanical properties of the composites (Leman et al. 2008; Ishak et al. 2009). The alkaline treatment partially dissolved the hemicellulose and lignin present in the fibre and increased the amount of exposed cellulose (Li et al. 2007). Moreover, the alkaline treatment removed the cementing materials that consisted of low molecular fats, hemicellulose, lignin, and pectin, which enhanced the interlocking between the fibre and matrix. This led to better mechanical properties (Kabir et al. 2012; Saba et al. 2016). The thermal degradation of bio-composites is crucial because natural fibres are affected when exposed to elevated temperatures during the manufacturing process or applications of the product. It is very important to confirm that the fibres used in the composites can withstand the applied temperature. Approximately 15 mg of SPF/PF composite powder was used to evaluate the thermal behaviour. Generally, bio-composites undergo three thermal phases (El-Shekeil et al. 2014). The first phase is moisture evaporation, which is followed by the degradation of hemicellulose, cellulose, and lignin (Rajkumar et al. 2016). The thermal characterisations of the UT, AT, and ST composites are presented in Figs. 8 and 9, and Table 1 summarizes the data. There were three thermal degradations of the natural fibres. The first degradation was moisture evaporation, followed by the decomposition of hemicellulose, cellulose, and lignin, leaving ash as the final residue (Rashid et al. 2016a). Based on these results, there was no considerable difference in the thermal degradation of the untreated and treated SPF/PF composites. The UT, AT, and ST composites revealed the same thermal degradation trends. 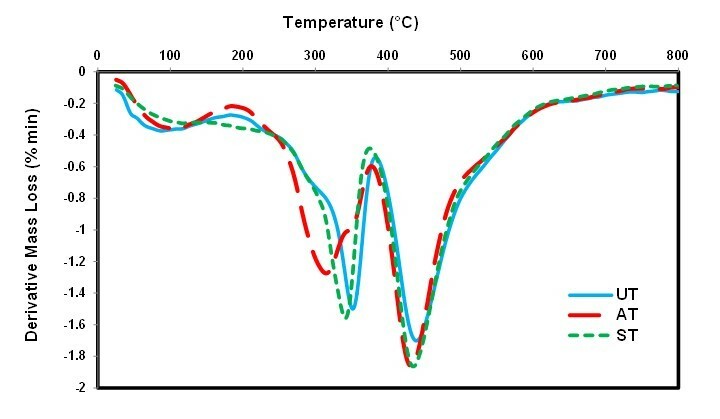 Figure 9 showed that there were 4 thermal degradation peaks for the UT and ST composites. The AT composite had 3 peaks of thermal degradation. This was because the second peak was related to hemicelluloses, and hemicelluloses disappeared after the alkaline treatment. The alkaline treatment helped to dissolve the hemicellulose and some lignin in the fibre. For all composites, the first peaks corresponded to water loss, which occurred from 30 °C to 200 °C. Based on the values of mass degradation loss in the first decomposition step recorded in Table 1, the AT composite exhibited lower moisture evaporation loss compared with the UT and ST composites. This was attributed to the alkaline treatment reducing the hydrophilic tendency of the natural fibre in the composites. In this stage, the decomposition included the loss of small end groups, such as CH2OH (Milanese et al. 2012). The initial decomposition was measured by the 5% weight loss of the composites (Yakubu et al. 2013). 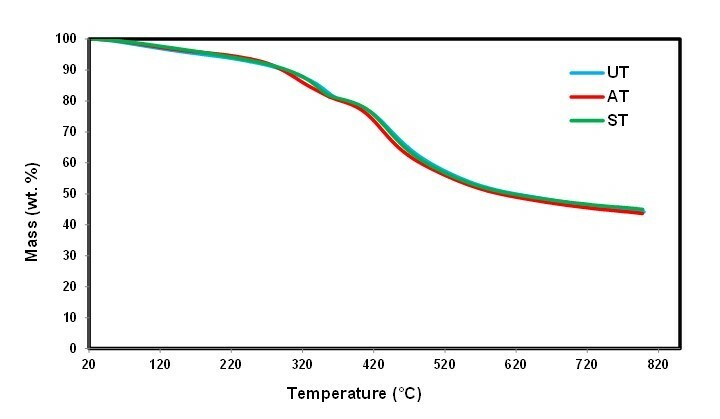 The temperatures at which the initial degradation of the composites occurred were 181.27 °C, 211.04 °C, and 198.79 °C for the UT, AT, and ST composites, respectively. The second phase of the degradation of the composites, which corresponded to the degradation of hemicellulose, was located between 200 °C to 300 °C. The DTG curve of the AT composite had no peak within this range. The third degradation phase in the UT and ST composites and the second degradation phase for the AT composites represented the decomposition of cellulose. As the temperature of the composites increased, the cellulose structures broke down, and volatile hydrocarbons were released from the fibre as a result of the thermal degradation of the hemicellulose, cellulose, and lignin (Razali et al. 2015). Due to its complexity, lignin degraded at a slower rate and wider temperature range than the hemicellulose and cellulose (Ishak et al. 2013a). From the DTG curves, the peaks observed in the temperature range between 300 °C to 400 °C were located at 313.34 °C, 341.26 °C, and 353.81 °C for the AT, ST, and UT composites, respectively. Moreover, the thermal degradation in the second and third phases may have also corresponded to the loss of small groups and weaker bonds in the chains of the chemical structures in the phenolic matrices and natural fibres, such as –OH and –CH2 (Milanese et al. 2012). The last thermal degradation of all composites, which corresponded to the loss of benzene rings in the phenolic resin structure, occurred between 400 °C to 500 °C. In this stage, there were large mass losses of about 40.25%, 41.42%, and 40.91% in the UT, AT, and ST composites, respectively. The maximum degradation temperature peaks were at 430.97 °C, 423.61 °C, and 426 °C for the UT, AT, and ST composites, respectively. As the temperature increased, the UT composite showed better thermal stability than the AT and ST composites. This result was possibly because of the high Si content in the untreated vs. treated composites (Rashid et al. 2016a). The surface treatments partially removed the outer surface, which was rich in Si content and complex chemical structures, and contributed to the thermal stability of the composites (Luo et al. 2015; Shi et al. 2016). Table 1 presents the thermal characterisations of the UT, ST, and AT composites. All composites exhibited nearly the same thermal stability, with no considerable differences. Notably, the UT composite exhibited a slightly higher thermal stability than the ST composite. This have may corresponded to the high percentage of Si in the untreated SPF (Rashid et al. 2016a). However, the residue char percentages, which represented the remaining materials after the volatiles were eliminated above 800 °C, were still high. The residue char percentages were 44.16%, 43.66%, and 44.97% for the UT, ST, and AT composites, respectively. These high values corresponded to the crosslinked phenolic resin, indicating that the untreated and treated SPF/PF composites had high thermal stability (Zárate et al. 2008). The impact fractured morphologies of the untreated and treated SPF/PF composites were analysed by SEM. Figure 10 shows the morphological analyses of the untreated composite. There was poor adhesion between the fibres and matrix, and debonding was observed, which suggested that the untreated fibres were covered by a thick outer layer that contained pectin and wax (Ishak et al. 2009; Rashid et al. 2016a). This outer layer was weak and caused poor compatibility between the fibre and the matrix. Debonded fibres were present as observed from the SEM images, and thus, the load transfer may have been ineffective. Moreover, there were pulled out fibres, which left holes and indicated the poor interlocking between the fibres and matrix. Possibly, this was the reason for the lower impact strength of the UT composite. The SEM analyses of the factures of the ST composite after the impact test are shown in Fig. 11. The fibre-matrix bonding mainly affected the mechanical behaviour of the biocomposites. The good and adequate interfacial bonding between the fibre and matrix resulted in sufficient stress transferring between the fibre and matrix. This positive adhesion of the fibre-matrix enhanced the properties of the composite. Due to its salinity, the sea water removed the rough outer layer surface of the SPF and enhanced the interlocking of the fibre-matrix. The SEM images of the ST composite exhibited more fibre breakages and fewer fibre pull-outs, which indicated better fibre-matrix interfacial bonding. Thus, the sea water treatment improved the interfacial bonding of the fibre-matrix, resulting in higher impact strength in the ST composite than in the UT composite. Figure 12 shows the SEM images of the AT composite after the impact test. The images reflected the good bonding of the fibre-matrix. There were fewer fibres pulled out compared to the fibre breakage, and there was no gap or debonding between the fibre and matrix. Also, the fibre stayed firm in its position. These observations indicated the good interlocking of the fibre-matrix, which resulted in the high mechanical properties of the composites. The SEM observations were in agreement with the mechanical properties of the UT, ST, and AT composites, proving that the treated fibre enhanced the behaviour of the composites. This study evaluated the effect of alkaline and sea water treatments of the SPF filler on the properties of the phenolic composites. The alkaline and sea water treatments enhanced the interfacial bonding strength and wettability of the fibres with the phenolic resin, which resulted in improved mechanical properties of the composites. 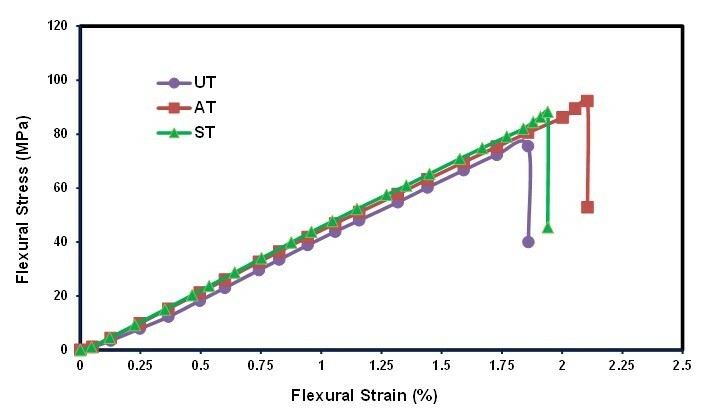 Compared with the UT composite, the flexural strength was greater by 23.1% and 17.2% for the AT and ST composites, respectively. The impact strength was improved by 35.3% and 24.9% for the AT and ST composites, respectively. 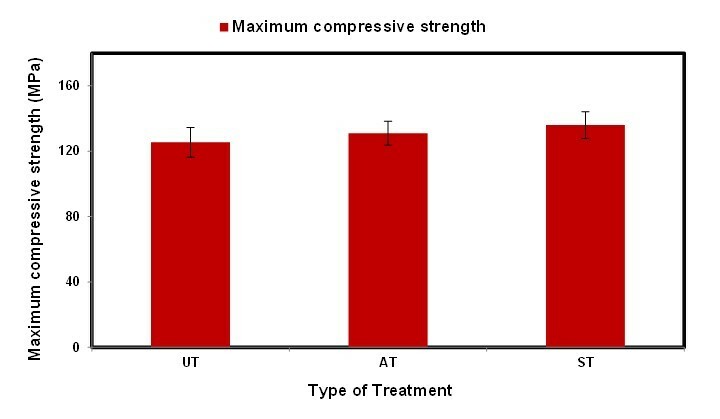 In addition, the compressive strength increased by 4.8% and 8.7% for the AT and ST composites, respectively. The treated SPF composites showed lower thermal stabilities than the untreated composite due to the lower Si content in the SPF fibre after both treatments. The results were supported by SEM analyses, which exhibited a good interlocking of the fibre-matrix and less fibre pull-out for the treated composites. The authors are grateful for the financial support from Universiti Putra Malaysia via grant no. GP-IPS/2014/9447200. The authors would also like to thank the Ministry of Higher Education and Research of Iraq and Institute of Technology, The Middle Technical University, Baghdad, for the scholarship that was granted to the corresponding author. ASTM D695-15 (2015). “Standard test method for compressive properties of rigid plastics,” ASTM International, West Conshohocken, PA.
Bachtiar, D., Sapuan, S. M., Zainudin, E. S., Khalina, A., and Dahlan, K. Z. H. M. (2013). “Thermal properties of alkali-treated sugar palm fibre reinforced high impact polystyrene composites,” Pertanika Journal of Science & Technology 21(1), 141-150. Bai, J. (2013). Advanced Fibre-Reinforced Polymer (FRP) Composites for Structural Applications, Elsevier, Amsterdam, Netherlands. Ishak, M. R., Leman, Z., Sapuan, S. M., Salleh, M. Y., and Misri, S. (2009). “The effect of sea water treatment on the impact and flexural strength of sugar palm fibre reinforced epoxy composites,” International Journal of Mechanical and Materials Engineering 4(3), 316-320. Obasi, H., Iheaturu, N., Onuoha, F., Chike-Onyegbula, C., Akanbi, M., and Ezeh, V. (2014). “Influence of alkali treatment and fibre content on the properties of oil palm press fibre reinforced epoxy biocomposites,” American Journal of Engineering Research 3(2), 117-123. Sudha, P., Nasreen, K., and Vinodhini, P. A. (2015). “Natural fiber composites and applications,” in: Green Polymers and Environmental Pollution Control, M. N. Khalaf (ed. ), Apple Academic Press, Oakville, Canada, pp. 335-364. Surojo, E., Jamasri, Malau, V., and Ilman, M. (2014). “Effects of phenolic resin and fly ash on coefficient of friction of brake shoe composite,” J. Eng. Appl. Sci. 9(11), 2234-2240. Thakur, V. K., and Singha, A. S. (2015). Surface Modification of Biopolymers, John Wiley & Sons, Hoboken, NJ. Article submitted: November 9, 2016; Peer review completed: December 29, 201; Revised version received and accepted: December 30, 2016; Published: January 10, 2017.